Bluetooth Stereo Amplifier Receiver, FM Radio/USB/SD memory SPECIAL OFFER! 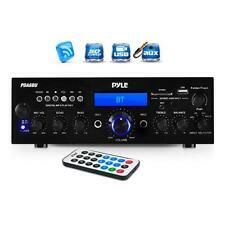 The Pyle Bluetooth Stereo Amplifier Receiver is the perfect solution for all of your audio needs! Using the latest sound amplification technology, this versatile system is designed to perform and deliver clear, accurate sound. It s loaded with plenty of audio playback options along with a wide range of device compatibility, so you can connect and play it all! The compact receiver features Bluetooth wireless streaming that works with all of your favorite devices (like a Smartphone, Tablet, Computer, Laptop, etc.). USB Flash and SD Memory Card Readers allow you to quickly stream media from your computer s media library. Connection Inputs include: Aux (3.5mm) Input, 1/4'' Mic jacks, RCA (L/R) Connectors, Banana Plugs, along with a USB port to charge your device. So far, it's our favorite vacuum tube kit! In the music demonstration video, note that the camcorder does not pick up music signals well. It accentuates high frequencies, and does not reproduce bass well. Boomer 250 Watt Linear Amplifier For Cb Radio. Condition is Used. Shipped with USPS Priority Mail. Our box will draw <3 ma from your radio and will key any amplifier. A very handy accessory. Many newer radios can only provide for a small amount of current on the external amplifier keying output. 1 x Hi-Fi Stereo Amplifier(not include power adapter). - MP3, iPod, CD player input jack. It also has a jack for plugging your MP3, MP4, iPod or CD player. - Stereo sound and heavy bass output. Frequency Response: 20Hz-20KHz. 200W max power output. It also has a jack for plugging your MP3, MP4, iPod or CD player. 1 x Hi-Fi Stereo Amplifier. MP3, iPod, CD player input jack. Speaker Impedance: 2-8Ω. Jack input: 1/8"" (standard stereo jack). Antenna Signal Amplifier. A compact unit that is easy to install and hide under the dash. Strong 15 to 20 db gain. Frequency range 80--120Mhz ( input 1--1.5W) 140--170Mhz (3--4W). 4: the test power connected to push, push, push FM maximum 1.5W, maximum VHF 4W FM and VHF, the basic do not adjust, promote the UHF Max 7W-8W, UHF adjusts the variable capacitor to obtain optimum output power. UHF 400--470MHZ 100w Amplifier. Frequency: 400--470MHZ. Output: 100W. DIY kits，not assembled, need solder after you get. A pre-used transistor and and ATC capacitors but everything else is new and shiny. Car Radio Antenna Signal Amplifier Booster. 1 x Antenna Amplifier. Red wire connects to power antenna lead or 12V source. Compatible with ALL AM FM stations. Great reception and Clearer radio. Improves signal concentration.
' Features: 5-Channel Powered Amp Design Lightweight & Compact Size Bluetooth Wireless Music Streaming Receiver Hassle-Free Connection with Automatic Pairing Ability FM Radio with Digital LCD Display Front Panel Button Control Center HDMI Output (2) HDMI Inputs Aux RCA (L/R) Audio Input Jacks Spring Loaded Speaker Terminal Connectors Full Range Stereo Sound Reproduction RCA Subwoofer Output Includes Remote Control Bluetooth Connectivity: Built-in Wireless Music Streaming Receiver Compatible with All of Your Favorite Bluetooth Devices (iPhone, Androids, Smartphones, iPad, Tablets, etc.) 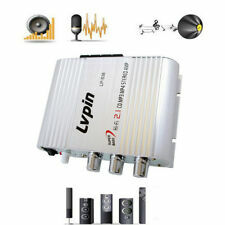 Bluetooth Version: 4.0 Bluetooth Network Name: ‘PyleUSA’ Technical Specs: MAX Power Output: 100 Watt (5 x 20W) HDMI 2160p Support Bluetooth Protocol Support: AVRCP V1. Use this adapter to make your installation of an amplifier to the factory system faster with a cleaner install. Provides one pair stereo rca output and a power wire for the remote amplifier turn on connection. Features: Home Theater Audio Receiver System High-Powered Hybrid Pre-Amplifier Built-in Bluetooth for Wireless Music Streaming Digital VFD Display with AM/FM Radio Connect & Stream Audio from External Devices MP3 Audio File Playback Support USB Flash & SD Memory Card Readers Front Panel Button & Rotary Controls LED Backlight Illumination with Dimmer Control Digital Fluorescent Audio Level Output Display Meter RCA (L/R) Audio Input/Output Jacks Dual Mono RCA Jacks Dedicated for Subwoofer Output Screw-Type Speaker Terminal Binding Posts Headphone Jack, 1/4’’ Aux (3. Maximum output power: 34.8dbm(3W). This RF Power Amplifier 's t ypical power Gain is 35 dB. 1 x RF Power Amplifier. Maximum input power: < 10dBm. Typical power Gain: 35 dB (> 300M Gain slightly decreased).